Ever thought about going overseas? Now you can spend an exciting year discovering a new country of your choice. Learn a new language, make new friends, and get work experience at the same time. Join in our au-pair program now! We carefully select a host family that will take care of you as a family member and welcome you with open arms. We will always make sure that the family meets your expectations. You will be taking care of the child/children and might be required to do some housework. In return you will get your own room, all meals provided, regular time off, and weekly pocket money. - You are at least 18 years of age. - You like children and have some child care experience/education. - You have graduated from high school. - You have no criminal record. - You would be interested to stay with your host family for 6 to 12 months. - You will purchase your own flight ticket (refunded by your host family). - You will arrange travel insurance at your own expense. 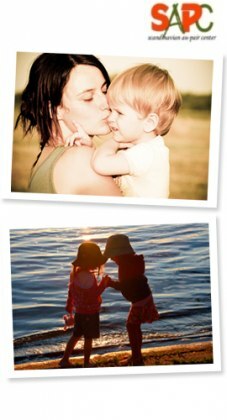 What does an au-pair do? During your stay as a family member in your host family you will be required to take care of the child/children. You can work with younger children or school age children depending on which family you decide to stay with. You will be giving them breakfast, lunch, prepare/cook dinner. Join in and play with them, help with school work and drive them to and from school. Sometimes take them places, in short be there for the children as company, for help and support. The family also wants you to do some lighter housework. You can be asked to do the dishes, vacuum, clean, do the laundry, walk the dog (if they have one), sometimes cook, bake, etc. Your duties will come as a natural part of living with your host family. All your duties will be discussed and put on paper before you go. When and if the family goes on vacation, you will, in most cases, travel along to help with the kids. In return you will be provided with your own room, weekly pocket money, and all meals catered for. You will have regular days off to study, meet friends, go sightseeing, and do sports or other social activities. There will always be one of our offices/agencies nearby. We are there for you, for help and support of any kind. It's important to us that you have a great time during your stay with your host family. In any event of a disagreement, give us a call and we will try our best to solve it. We will supply you with an emergency phone number which you can call 24 hours a day. In any event of dispute or disagreement with your host family it's important to be willing to talk it out and solve it. Most things can be solved if you let them know how you feel. You will have a responsibility to stay the agreed time, otherwise you will lose the refund of your flight ticket. Don't hesitate to contact us, we are there for YOU. Should the need arise, we will find you another host family. However, we are confident that you are going to enjoy yourself and have a wonderful time! This agreement has been signed by Belgium, Denmark, France, Germany, Greece, Italy, Luxembourg, Norway, and Switzerland. Similar rules apply to other European countries. - The au-pair has to be between 17 and 30 years old. The upper age limit may be lower in some cases. Scandinavian Au-Pair Center only accepts applications from au-pair candidates between 18 and 30 years of age. - The au-pair is allowed to work for the same family for a maximum of 12 months, in exceptional cases 24 months. - The au-pair must have a medical certificate not older than three months. - The duties of the au-pair must be specified in a signed agreement between the au-pair and the host family. The agreement must also specify the payment to the au-pair. - The au-pair has the right to be totally free from work at least one day each week. The day off must be a Sunday at least once each month. - The au-pair has the right to take a language class. - If the au-pair needs insurance not provided by the authorities in the host family's country, such insurance should be paid for by the host family. - Both the au-pair and the host family must give at least 14 day's notice if the au-pair leaves earlier than agreed upon. Only in case of serious misbehaviour or other serious circumstances can the au-pair leave or be asked to leave immediately. In Germany, there is a special rule saying that at least one of the parents in the host family must speak German from birth. As soon as we receive your application form, we will put it on file. The application is forwarded to our main office in Helsingborg, Sweden. There we will start the search for a suitable host family. You will be notified as soon as the right family has been found. The chosen host family will also contact you. This will give you opportunities to find out more about the family and what they expect from you. Since this is a good time for questions, you should prepare a list of things you would like to know in advance. If you and the family match, we will go ahead with the rest of the procedure. Travel arrangements can be booked in accordance to your departure. Contracts will be drawn up. You and your family will both receive a copy. If, by chance, the host family that we found for you is not to your preference, we will continue the search until you are fully satisfied.